I’m taking a break from my Berlin travel diaries to share you with you some very important news. How important? So important that it might just make you a million pesos richer! Yes, you read that right. Count those zeros because your eyes aren’t fooling you! 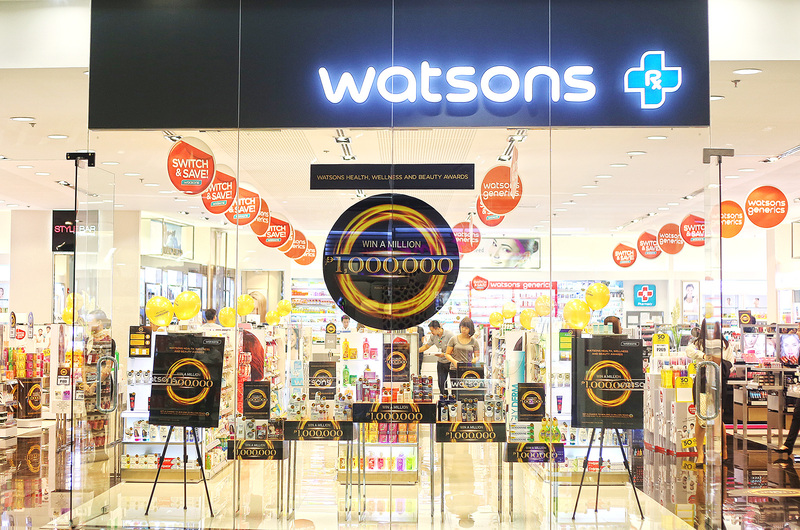 Keeping the promise of “Always More”, Watsons is giving away P1,000,000 cash and other prizes to loyal Watsons customers through its Win A Million promo! Isn’t that awesome? With Watsons, you not only get to look good but feel good too! All you have to do to join is go to a Watsons store or The SM Store Beauty Section between now to October 22, 2014 and purchase a Watsons recommended product. For every P500 purchase, inclusive of any of the Watsons recommended participating brands, you are entitled to join the e-raffle upon registration and texting of entry. Just one Watsons recommended product is enough, as long as your total purchase amounts to at least P500. This isn’t really all that hard to achieve since Watsons has all our favorite personal care and beauty products. In fact, when I went to Watsons’ SM Aura branch to join the promo, I was grabbing things left and right! I was so happy to find that most of my top beauty and skincare choices are part of the promo! As you can see, you have plenty of Watsons recommended products to choose from like Dove, Creamsilk, Revlon, Gatsby, Olay, Ponds, Nivea, L’oreal, Sensodyne, Swish, Maybelline, Careline, Ever Bilena and more. 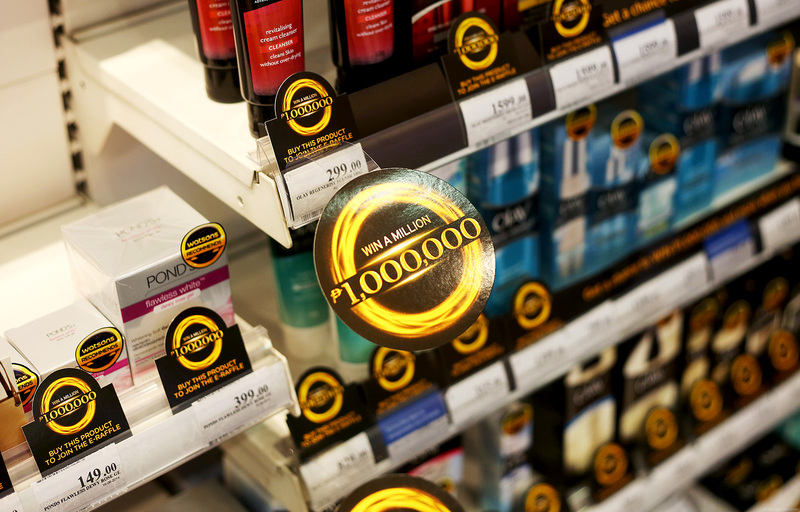 Just look for the products with the “Watsons Recommends” sticker on them. Since I’m addicted to my hair’s health nowadays, my loot included a new shampoo and conditioner. I stocked up on my favorite in-shower lotion from Nivea too! I got a bit of makeup as well because a girl’s gotta look good! Once registration was confirmed, I then texted WATSONS <invoice number/number of entries earned> to 2948 to submit my entry. 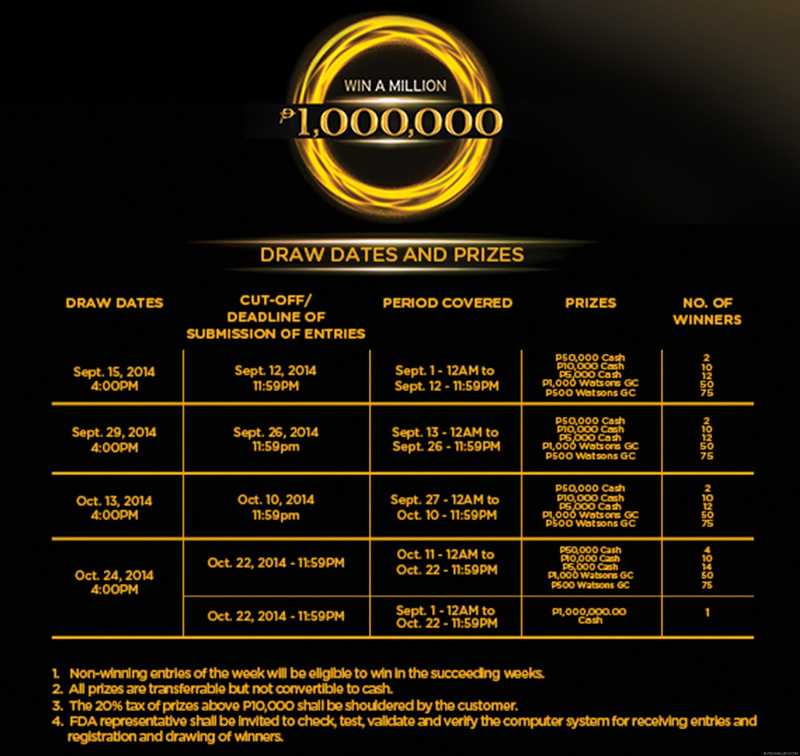 Since my purchases amounted to P2000+, I got 4 entries. (Example: WATSONS 123456/4). After getting a text confirmation of my submission, I crossed my fingers and hoped for the best. Who knows, my lucky stars just might be listening. You should try your luck too! Check out the prizes below! You shouldn’t miss out! Promo is only until October 22, 2014. Visit Watsons’ website and Facebook page for full mechanics and other details. Hi camille, just wondering who got the 1million price? That’s a nice thing to share. Thanks a lot ! Oh no, I missed it! So sorry! :( Happy birthday though! I must join too.Haha…must shop there..now na! I love how you live on 123 Blah Blah Street, Camille! Haha! Kidding aside, I like this promo! Watsons has a lot of my personal favorite skin care products like Cetaphil, Dove, Nivea and Neutrogena :) I’ll be sure to join soon!